Wire. Duct tape. Electrical tape. Three half-foot lengths of solid steel rebar. These were some of the materials that Virgil Dolby, 61, used to try to secure his refrigerator-sized Romney–Ryan billboard against the vandals who would pry it from out of his front lawn every night. When nothing deterred them—not even the gobs of Vaseline he smeared onto the plywood frame he’d built for it—he and his fiancée, Anna Yevropina, chose to display it another way: mounted in the bed of his rusty gray pickup truck, which he parked along the highway at the edge of Sterling, Virginia, on Saturday. Dolby and Yevropina chose an optimal spot to anchor their sign. Sterling is what you might call persuasion territory. It is a diverse, white-collar town right on the Virginia-Maryland border, with a median income of $83,000, in Loudon County, Virginia’s most affluent. Obama carried this area with 54 percent of the vote in 2008. Yet Loudon and its surrounding counties remain competitive. Romney's chance of winning Virginia, and its 13 Electoral College votes, depends on his ability to coax the area’s well-to-do white voters who supported Obama four years ago to abandon him, in the next 72 hours. The Obama campaign, in the waning days of the election, has an entirely different mission: ensuring turnout among those who are already persuaded. And on Sunday, the president’s almost absurdly precise Virginia ground game brought canvasser Gerry Wurzburg, 62, to a clump of anonymous apartment buildings in Dale City, 40 miles south of Loudon County. 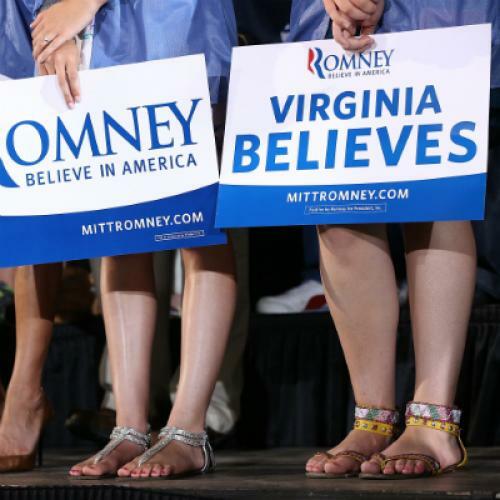 Persuasion versus turnout is not the entire equation in Northern Virginia, and for an edge, Romney can look to the mechanics of Election Day. The particulars of the state’s ballooning population growth may favor Obama, but its election laws skew the other direction. Virginia has a lenient but potentially confusing voter ID law, and voting rights groups anticipate squadrons of conservative poll watchers who face a very low evidentiary burden to call votes into question. Someone like Alonzo—who says he lost his voter registration card and doesn’t have any bills in his name at his current address, two forms of ID he could use to vote—would be an easy target for a challenge. Many Romney supporters I met planned to work as poll watchers on Tuesday, including Yevropina, who did so when she lived in Maryland “because of all the African-Americans."